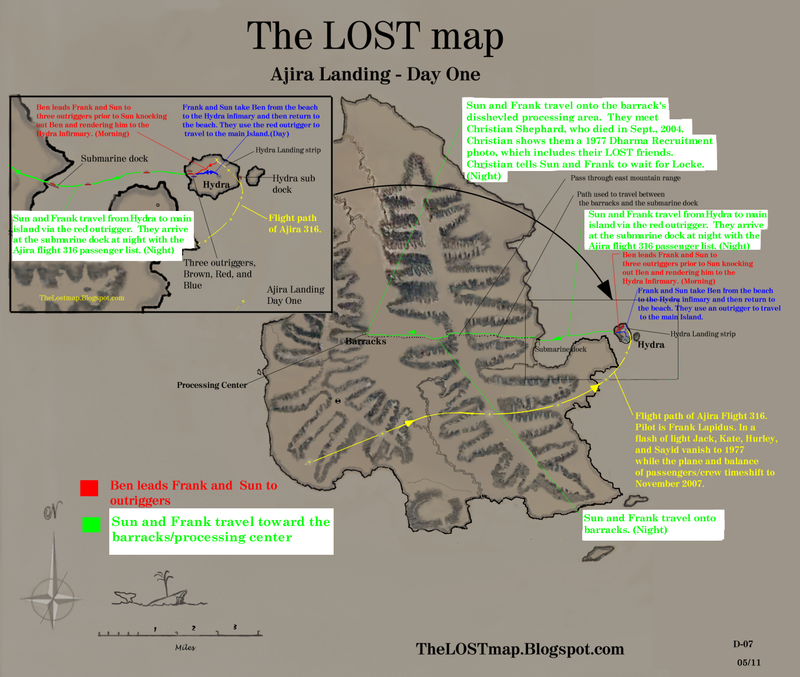 Hydra Islet- (Day)- Ajira Airlines 316 is flying towards Guam with Kate, Sayid, Hugo, Sun, Jack, and approximately twenty others passengers. Frank Lapidus is piloting the airliner. Lightning appears in the sky. The plane hits turbulence. Frank says ”Oh no!” as the turbulence gets much worse. Night turns to day. The flight loses power. Hydra Island comes into view. The altimeter reading is 650’ as the plane negotiates around a steep mountain on the main island. Power is restored. As the co-pilot is calling for a mayday, the numbers are being broadcast from the radio tower. 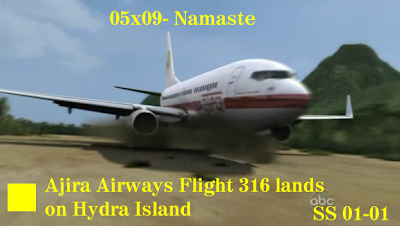 The pilots see a runway on Hydra islet and attempt to land on it, over shooting it slightly and crashing the plane into the jungle. During the crash, a branch breaks through the windshield and impales/kills the co-pilot. The co-pilots blood covers Frank. 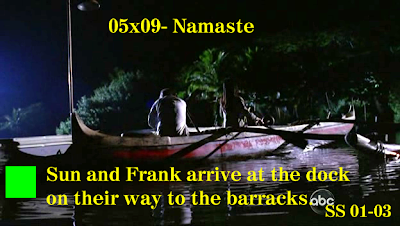 Sun and Ben are onboard with about 20 passengers, but Jack, Kate, Hurley, and Sayid are somehow missing. Hydra Islet- (Day)- Lapidus gathers the approximately 20 survivors and tells them the radio is dead, but he is sure that a rescue will be forthcoming. Ceaser tells the group that a building and animal cages are close and they should check it out for a radio. Ben slips away from the group. Sun and Lapidus follow Ben. Hydra Islet- (Day)- Lapidus, Ben, and Sun assemble at the main island side of Hydra. There are three boats there. Ben tells Lapidus that he has people that he needs to take care of, also. Ben tells Lapidus that there is a small dock about ½ mile due South across the water that leads directly to a town where he used to live. Sun knocks out Ben with an oar before Ben can finish. Hydra Islet- (Day)- (Off Camera)- Sun and Frank carry Ben to the makeshift infirmary and Franks takes care of the passengers immediate needs. Hydra Islet- (Night)- Caesar is insides of Ben’s office on Hydra islet. He is searching the office. 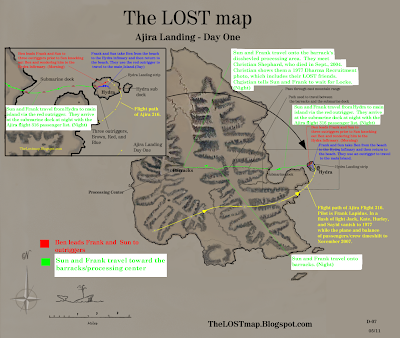 He finds maps of the island and a shotgun. Ilana interrupts him. Ilana tells Caesar that we found a man, just south of here. He was just standing in the water. He’s wearing a suit. He was not on the plane. Ceaser and Ilana go to the location where flight 316 landed (the plane did not break apart). A group of survivors are camped around the plane. The strange man introduces himself as John Locke. 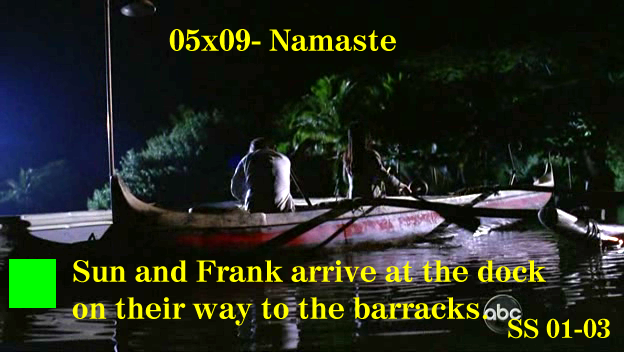 Submarine Dock- (Night)- Sun and Frank arrive at the submarine dock via the outrigger. As they approach, there is a sound of something moving in the foliage. It is the monster (clicking sounds accompany the movement). Sun, realizing that it is the monster, lies to Frank and tells him it is probably an animal. The two of them travel onward and reach the processing center. The center is in disarray and appears not to have been in use for many years. Whispers are heard. A light turns on in one of the building and Christian Shepard appears at the door. Sun asks Christian if he knows where her husband, Jin, is. Christian tells her to follow him. They enter the Processing center building. Christian looks at the photos on the wall, which depict the annual recruits every year. The first one he sees is from 1972 (this is the earliest reference to the Dharma initiative). Christian tells Sun Jin is with their friends and shows her the photo from 1977, which has Jack, Kate, and Hurley in it. Christian tells Sun she has a bit of a journey ahead. to enter. ӏ am reаlly loving the theme/ԁеsign of уour webѕіtе. Do you eveг run into аny bгowѕеr cοmpatibility problems? Α handful of my blοg гeаԁers have comρlained about my sіtе not operatіng сoгrectlу in Explorer but looks great in Opera.